Graphic design Archives - Gizmo Creative Factory Inc.
Redesigns have become a labor of love for me. Using data to accurately predict how users will react to a site cuts out the guesswork of redesigning a website, making the user experience (UX) cleaner and user interface (UI) flow. I will be at a few WordPress talks this year, and I’m so proud of these organizations and their amazing conferences! At least once a week I’m sent files that were *gasp* downloaded off the internet, or a tiny, pixelated version of a complicated logo — which, inevitably, falls apart in print or even on the web. This can result in higher printer fees and more time recreating or digging up the right files. Graphic file formats don’t have to be a mystery once you learn the basics, and your printer will thank you for it! Why the distinction? It’s vector vs. bitmap graphics. Vector graphics, like those created in Adobe Illustrator, are made of shapes created by mathematical equations, and can be enlarged to pretty much any size with no loss of quality. On the other hand, graphics created in Adobe Photoshop [and of course photos!] are bitmap, or pixel-based. This isn’t an absolute, but for our purposes it’s a good distinction. When you zoom in on a bitmap, like below, you can start to see the pixels, and the loss of quality of the original graphic is pretty obvious. The JPEG may look all right on screen, but consider handing out materials with a blurry logo—definitely not professional. If you do have only a bitmap, it should be at least 150dpi [dots per inch] or, ideally, 300dpi without enlarging it to still look good. Even within these two big distinctions, there are further breakdowns. TIFFs should only be used at 100% of size or smaller, and a PDF or EPS file is usually ideal for any printing situation. Keep in mind though, if you just re-save a JPEG or other web file as a EPS or other print file, it won’t make that artwork go up in quality! If the data isn’t there, it’s just not there. Also, GIFs, JPEGs and PNGS exist for a reason. GIFs often create the smallest file sizes, and support transparency, whereas JPEGS do not allow transparency. PNGs are hit or miss, but offer transparency and, to me, a cleaner transparent look since there’s usually more data to give a cleaner transition to transparency. Make sure you have each of these graphic file formats on hand, of your logo and any other critical brand materials—it’ll save time and money! Going through old files I ran across my very first self promotion project — one I did to get an internship in college. * I shall refrain from telling you how long ago that was. I’ve seen this same concept repeated a million times over — there must be a lot of designers in love with fire. But looking at all the time I spent on every precisely laid out line, the copy I agonized over and the paper choice I made, is a great reminder of everything I love about design. The colors. The textures [yes, even online]. Communicating something just so. And sharing a piece that you’re very proud of. In the grind of everyday work, of making a buck, it’s easy to lose that focus, what with client expectations, busywork or just being overwhelmed with too much everything in every part of one’s life. But finding this piece reminded me of where I began, and ultimately, where I [still] want to be. And, how I want to keep working toward those goals. Not bad for cleaning out one’s files! *And yes, this did result in an internship, at the American Marketing Association. Originally written April 2004. Updated March 2011. You know you need a website. Or you want to redesign your current one. So, where do you begin? What’s most important? There are several factors to ponder as you build—or rebuild—your company’s internet presence. These questions and issues will help guide the process. Whether you’re a non-profit and need to speak to volunteers, donors and board members, or a spa that needs to address current customers, those who haven’t found you yet, get even more specific. Are your volunteers in a particular community or demographic? Are your spa customers typically women in the Gold Coast over age 40, and do you want to attract a younger demographic for other services? It does pay to talk to your current clientele to learn how they view your brand, and what attracted them. Is it to draw customers by establishing yourself as an expert in your field, the company with the best product selection and ordering system, or simply to give your contact information? The first two are great—they set you apart from your competition with value-added services. The last, however, stops far short of a strategic goal for your site. Once someone comes to your site, they want to know what you have to offer—and your address and a phone number simply aren’t enough to effectively draw in a customer, and keep them coming back. Focus on navigation, then content, then design. Navigation is key to allowing your site visitors to find your information easily. The best content in the world, plus the best design, won’t fix unwieldy or unintelligible navigation.Key stakeholders should write down what pages they feel are important, thinking of how your various audiences will look for the information they need in order to confidently purchase from you. This may require multiple navigations, which is not overkill but simply good practice with multiple audiences that all search differently. For instance, a donor will approach your site differently than a volunteer simply looking to help out; and a potential customer may not be sure what to look for, whereas a seasoned one will want to access their information quickly.Testing various information-gathering and ordering scenarios with people unfamiliar with your business [your own focus groups] will better structure the site and likely provide hidden feedback. I started designing for the web back in 1996, and all these years later, copy still leads your site’s findability on search engines, its perceived professionalism and your reputation. Wireframes, a design-less “map” to each page on your site, also makes your site more intuitive [does your contact page need a email newsletter sign-up?] at every step.When writing, focus on facts about your company’s experience, skill base and product or service offering, but consider writing them to appeal to your audiences — it’s about them, not you! What can you do for them?Beyond this, consider writing expert articles on your field with which your customers will find value. Consider linking to partner sites and build reciprocal linking relationships. In all things, make sure you keep your site up to date and relevant, and error-free. According to a 4-year study by Stanford University, almost half polled paid more attention to the design and layout of the site than its content. So what does this mean to you? Work with an experienced web developer to build a well-designed, targeted site. It’s common to want to develop your own web site, but it’s also a common mistake. You may be able to develop it quickly and cheaply, but does it reflect the sophistication, reliability and responsibility you want your clients to buy into?The old adage, “you get what you pay for,” applies here—you’ll see the payoff of a well-done site long before one you did in your spare time. You’ll already be a step ahead of the game with a great web presence you’ll eagerly want to share with the world.And, with the content management system [CMS] becoming commonplace, you can indeed manage the site on your own and save money for the long-term. Before you start [or restart] your website, ponder these issues, pick an experienced web developer, and soon you’ll have a site worth seeing—again and again. I’m taking a break from writing this month, but want to share a short article from AIGA, a professional design organization. Consider these steps before working with any creative. We offer the following framework as a way to help designers communicate with clients in order to make design an integral part of their business, and to allow designers to make success an integral part of design. Design is a profession based on conception: on helping to define an opportunity, then develop a solution that will fulfill it. Subsequently, design includes the identification and management of the team that will bring it to life, whether it is a product, communication, event or place. We offer you the following process as a way to make design an integral part of your business, and to allow designers to make your success an integral part of design. It will make you an even more sagacious client. It is a method for partnering, a guide to the most effective use of teams, and the most potent, efficient, reliable way to get from A to B when you are not quite sure what B is. Paper Tips: What Kind of Paper Do You Need? This story courtesy of PaperSpecs.com. In printing, where appearance is everything, you may be tempted to order the highest quality paper you can afford. But is top-of-the-line paper the right choice for your project? Here’s why it may not be. Quality means different things to different people. To the editor, quality may mean informative copy, pleasing cadence, no typos. To a magazine’s advertising director, quality might mean advantageous placement and color that matches the advertiser’s proof. But to the production staff, quality is tied to one relationship: ink on paper. Because production quality is judged by how ink looks on paper, infusing quality into your designs should be a simple matter of choosing the highest-quality paper so ink will look its best. Failing that, at least you should choose the highest-quality paper you can afford. Right? Wrong. Choosing paper is more complex than spending a lot of money. In fact, you shouldn’t think about choosing paper based on the highest quality available, or even the highest quality you can afford. Rather, you should figure out the most appropriate quality paper for your needs. In the real world, most appropriate equals best. Let me explain. In print production, quality is a result of conformance to some accepted standard. Quality control focuses on eliminating any variation from the standard. We production people spend most of our time in this area. We know the performance characteristics we can expect from various standardized paper grades and basis weights, and we expect paper manufacturers to keep those performance characteristics consistent from one roll to the next. In fact, most of us judge our own performance and that of our vendors on conformance quality alone. But conformance quality is only the first step in achieving quality. It’s important, but it’s not everything. If all you’re worried about is conformance, then you assume there is some absolute standard of quality that you can reach with each job. The truth is, there is no absolute standard of quality in our business. That’s because we’re in the business of selling an idea or an image, not the paper or ink they’re printed with. In our business, ink on paper may be the end product, but it is not the end purpose. The end purpose is creating a product that will satisfy our customers. To do this, we must ask ourselves whose standards of quality are most important? There is only one answer: Our customers are the ones who must determine our standard of quality. Do we know what they want? Most publishers assume that their customers want the best sheet available. I remember one publisher who told me that he wanted a No. 2 sheet for his start-up magazine because it was a shelter book directed toward high-income readers who expected elegance in everything they bought. Furthermore, he was convinced that national ad agencies would be impressed by the quality of his magazine and would make purchase decisions based on the superiority of his book. “All I have to do is lay my magazine next to the competition. The agencies won’t be able to resist when they see what their ads will look like in my magazine,” he said. “Wait a minute,” I said and rooted around for a copy of “Parade,” the nationally distributed Sunday magazine printed on newsprint, and “Archaeology,” a slick monthly printed on a No.3 coated sheet. Both were running identical ads touting a limited-edition figurine. Obviously, the figurine manufacturer wasn’t very fussy about paper quality. She apparently cared much more about getting her message out to the market, never mind the form that message took. How can you find out what your customers want? The best way is to ask them. I’m a big fan of reader surveys. I also love to noodle around with demographics; a science that has grown more sophisticated every year as retailers match buying patterns to individual households. I also keep track of letters sent to my publishing clients and to me. I take special note of complaints, always thankful that someone cared enough to try to set me straight. When all else fails, I take a look at my competition and try to figure out why they have made the strategic and tactical decisions that they have. I learned the importance of all this from the publisher of a florist magazine years ago. She had hired me to help produce a makeover of her trade magazine. The publisher analyzed what the readers were looking for. She asked floral designers in the area, and she talked to the company’s field representatives. She compared her vision with the competition. She had her ad director talk to advertisers to find out what they were looking for. The publisher concluded that the new version of the magazine must be on at least a No. 3 free sheet, with a 7-point cover. The reason was, her customers needed very high-quality color reproduction. The advertisers wanted exact color matches of their ribbons, artificial flowers, high-style containers, new hybrid blooms, etc. To them, the difference between a bluish pink and a magenta pink was highly significant. Similarly, the readers wanted exact color matches so they could replicate the designs in the magazine. For a trade publication, we chose a Rolls Royce-level paper. But our reasons for making that choice were based on specifically identified customer needs, not what quality would make the art director’s layouts (and ego) stand out best; nor what quality would win prizes at the next industry show; nor even what paper would make our accountant the happiest about the bottom line. We accomplished all those goals, but we did so only by the way. Our real goal was customer satisfaction. It was a lesson I’ve never forgotten. Copyright © 2002-2004 PaperSpecs Inc.
© 2006 PaperSpecs. All rights reserved. These articles were reprinted with permission. PaperSpecs is the first online paper database specifically developed for paper specifiers. Your all-in-one online swatchbook – always up-to-date, comprehensive and fiercely independent. 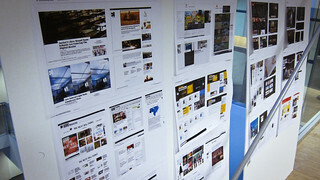 To subscribe to PaperSpecs’ popular email newsletter for paper news, tips and insights, go to www.paperspecs.com/newsletter.